No matter if you’re a DJ, a singer or a band, or if you own a nightclub that needs online presence, with the right theme you will be able to make wonders and collect a great number of new fans and visitors. I have great news for nightclubs and DJ’s, I’ve gathered a nice list of incredible WordPress themes that can transfer your website into an attractive place all your fans and visitors are going to enjoy browsing through. I’ll let you know the important details of each one of them in this article. As a DJ, surely you’d like your online presence to match the nature of your work. Here is a list of several fun, colorful, stylish themes perfect for you! Kontrol from CSSIgniter looks very attractive and it fits the needs of any DJ. This is a very powerful theme and it features custom options you can benefit from. A custom audio player is included and it looks very stylish. SoundCloud is supported too. Gigs and other events can be displayed in a lovely manner; your whole tour schedule can be presented with a Google map and details of each gig. Several post types are included so you can showcase your discography, photo galleries, albums, videos, artist all in various ways to make everything look even more interesting. The theme can be customized very easily thanks to powerful theme settings. Hernán from CSSIgniter is a responsive WordPress theme with a pretty layout and many custom options. A custom audio player is included and you can let your audience listen to your music hits while checking out your website. Your tour schedule can be presented in detail on a Google Map and you can specify anything you need to about each gig and share it with your visitors. Custom post types allow you to create various posts and present everything about your work in an original, interesting way. The theme is very easy to setup and customize. StereoSquared from CSSIgniter comes with a responsive layout and several custom options for promoting your work in the best possible way. Soundcloud integration lets you present your hits and allows your visitors to listen to your music on your website. Your tour schedule can be shown on Google Maps and you can add details for each gig. Six color schemes are included so you can choose the one you like most. The homepage is completely widgetized so you can built it any way you want to and make it look perfect. Muzak features a responsive layout based on Skeleton Grid. Six custom post types are included for presenting your discography, photo galleries, events and artists in a cool, stylish way. A slider is included as well for presenting your important stuff through it and making them look even more attractive. It supports WooCommerce so you can also sell your merchandise and albums/tracks through your website. Nine custom widgets are included and you will get 3 different homepage layout options to choose from. It is child theme compatible, too. EPROM is a WooCommerce ready theme with a responsive design. You will be able to promote and sell your music while not having to worry how your website looks on various devices, because it is going to look pixel perfect on any of them. Revolution Slider is included for featuring important content. The theme comes in dark and light design so you can choose the one that fits your style more. The R-panel management system allows you to customize the theme quickly and easily. Stylico comes with a bunch of handy shortcodes, custom post types (three of them), and custom pages for gigs and releases. Six custom widgets are included and there are seven widgetized areas, let’s not forget to mention 2 custom menu areas and 7 custom pages. English and German translations are included. Two great widgets are included, and they are both two-in-one: upcoming gigs/recent releases and popular posts/recent posts. A custom SoundCloud music player is built in through an awesome DJ Manager plugin. A funky looking slider on the homepage is included for featuring the most important and most recent news about your work. Music Label Pro is fully responsive and it also features a responsive video slider. A powerful music player is included with a playlist you can create so all your visitors can listen to your music right there on your website. There are endless customization possibilities with this theme, as it comes with 24 skins, 8 color pickers and 2 templates. You can make your own mixture and create a unique website. Media from YouTube, MixCloud and SoundCloud can be embedded on your website. Five unique widgets are included and the whole homepage is completely widgetized. Now that we’ve gone through these magnificent themes for DJs, let’s check out the themes that are perfect for nightclubs! Dance Floor is going to present your nightclub in an innovative, attractive way. It has a responsive mobile layout, a cutting edge, modern design and awesome visuals built in. You can upload the music you want and even add a video player, without having to install any extra plugins, everything is ready to go the second you install the theme. A pretty slideshow and event calendar are included in this dynamic framework so you can announce all the upcoming goodies you plan for your visitors, and you can do it with style. Social network integration widgets are provided, all you need to do is input your Facebook and Twitter id and your stream will appear on your website, as well as your homepage. NightClubbing is a WordPress theme created specifically for nightclubs and music websites. It features a video and audio player compatible with all popular players available, and you can add any of them to your website, all you need to do is past the code and you’re done. There are three different color variations you can choose from, and many customization possibilities for each. A gorgeous slider is included for promoting the newest and most important things about your nightclub, and there is also an event calendar for displaying upcoming events. Clubber comes in two styles you can choose from: dark and light. You can post video, photo and audio content on your website, and there is an audio player available as well so you can have music playing on your site at all times. The theme is responsive and it’s going to look great on all devices. Very easily manageable theme options and customization possibilities make this theme very easy to manage. 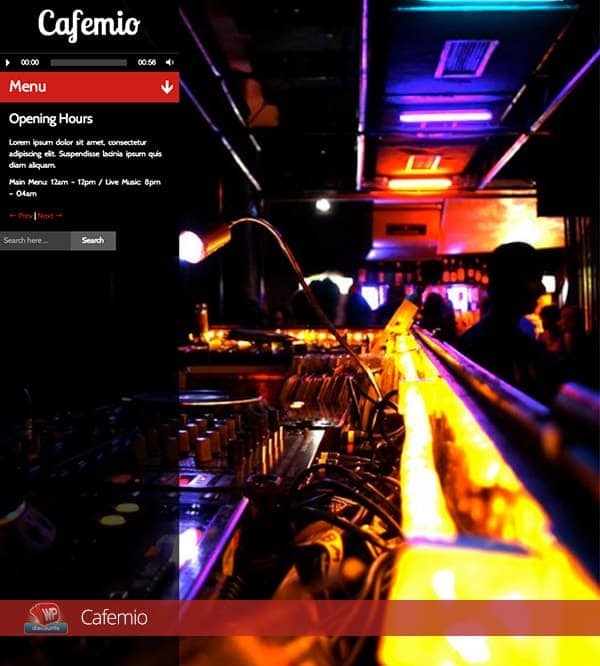 Cafemio features a fully responsive modern and unique design and a very easy to use custom admin panel. A full screen background slider is included and lots of easy to handle shortcodes. Custom post types are featured as well, for creating interesting, eye catchy post. The sidebar and menu are animated and there is a responsive audio player included as well. A working reservation form and jQuery tabs and accordion are included. 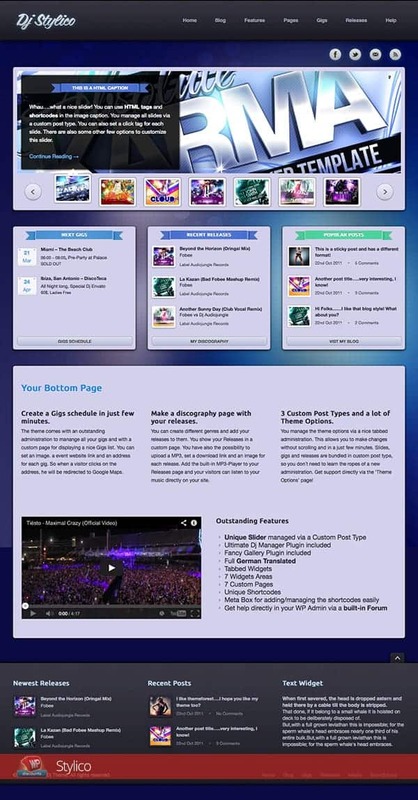 The music industry might be overwhelmed, and we all know there are tons of DJs and nightclubs out there, but is you choose to use a quality, awesome looking theme that works and functions perfectly, you can easily distinguish yourself from your competitors and give your visitors a brilliant experience when they open up your website. Presentation is everything when it comes to this niche, we all know this, so make sure you present your club/work the best possible way and eliminate competitors from the start! Thank you so much for this superb theme. I found one more beautiful theme named MusicTune.